2) Place butter, honey, and vanilla in microwave safe bowl and heat until butter melts (about 2-2:30 minutes). Stir the mix and let it sit for a few minutes as everything will be super hot. 3) While you are allowing the honey/butter mix to cool: place oats, cinnamon, brown sugar, jaggery, and all-spice in a greased 9×13 baking pan. 4) Mix all dry ingredients together. 5) Pour the honey mixture into the dry ingredients and stir until all oats are covered. 6) Bake for 30-45 minutes to start. Continue to bake in 15 minute increments until it reaches the desired texture with full stirring in between. We like ours a bit chewy but crunchy so I usually end up with a total time of 1.25 hours. Remember, the oats have to cool and will harden even more through the cooling process. As it is cooling be sure to stir occasionally so the oats don’t stick together. 7) Place in an air tight container and watch it disappear. 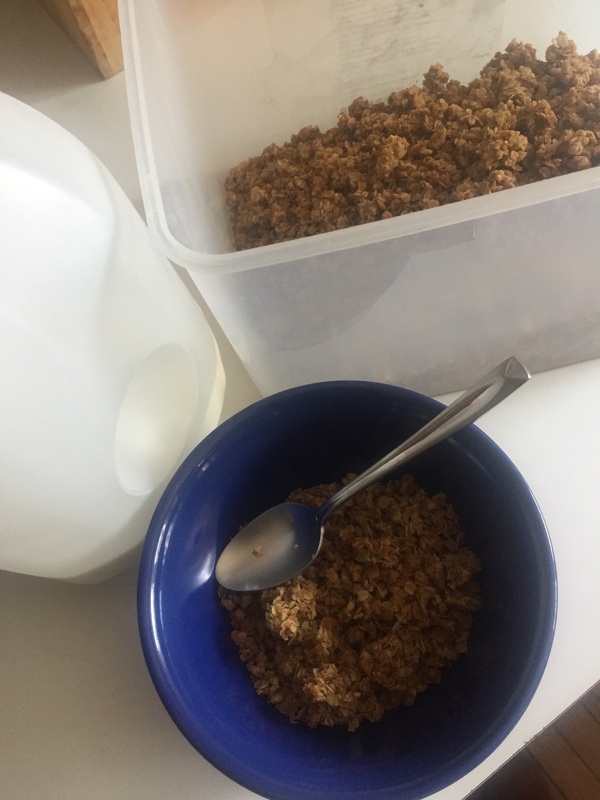 My fave way to enjoy this granola is in a bowl and covered with milk.